My kids gave me Robbie for Christmas. He’s black and gray. And I have already fallen in love with him. I cleared a corner in the living room and fixed it up, just for him. The minute I put him down in that corner he began to explore. He checked out the empty space beneath each chair, often bumping into the legs before he found his way out again. Then he headed for the stairs. I gasped as he reached the edge of the landing. I jumped from my chair expecting him to fall down the stairs. That is when I realized that he is a bit of a tease. He scooted up to the edge, but just before tumbling over he backed up a bit. He worked his way along the edge, inch by inch, until he reached the wall. Then he turned around and headed down the hallway. I thought he would lose his balance when he reached the threshold between the carpet in the hallway and the kitchen floor. But he mastered the transition with only a minor hesitation. He quickly gobbled up some crumbs that had fallen on the kitchen floor before he turned back to the hallway. Avon had left the bedroom door open, so this inquisitive little guy decided to check it out. Of course the first place he went was under the bed. I figured I would have to get down on my hands and knees to coach him out. But he gleefully scampered out the other side. Just as I reached to pick him up, he disappeared again under the bed. When he appeared again, I stood in his way so that he had to leave the bedroom. By the time he made his way back down the hallway, he was beginning to run out of energy. After a couple of diagonal passes across the living room he made his way back to his private corner. Robbie, of course, is my new robotic vacuum cleaner. It is cloudy this morning, but we have already had a lot of spring weather in the Pacific Northwest. The crocuses appeared in February and noticed that we didn’t have any snow, so they opted not to stay around for long. The daffodils bloomed quickly in March and disappeared. The bearded iris have started to bloom and the roses are full of buds. It looks like a promising spring. The swallows have returned and resumed their acrobatic antics. And in the mornings and late at night I hear the sorrowful lament of our resident mourning dove. He sounds as if he has taken up residence farther north this year. It is time to get my garden planted and hope we get enough rain this summer for it to grow. There is little snow in the mountains this year so we won’t be watering outside. The grass doesn’t seem to mind. We ‘ve been mowing since the last week of February. Today I think I’ll take a drive around the lake and see what else is in bloom. Is the Little Black Dress Still a Must Have? Does the little black dress continue to be an essential wardrobe element for the woman of 2015? Do you own one? According to Wikipedia the little black dress is “an evening or cocktail dress” that is simple and often cut short. This definition fails to recognize the scope of the little black dress. Prior to the Victorian era brides wore their best dress, whatever color it was, for their weddings. Often that was a black dress, especially in Scandinavian countries. During the Victorian era, and continuing into the 1920’s, the black dress was reserved for mourning. It was even considered disrespectful to wear black if not in mourning. According to Style List all of that changed in 1926 when Coco Chanel published a simple black dress in Vogue. Vogue described Chanel’s designs as the shape of the future and the concept of the little black dress as a must have was born. Chanel’s 1926 version was a simple black dress with long sleeves, featured with pearls. It soon became a woman’s go to dress for any occasion. The little black dress retained its popularity throughout the depression. It became a symbol of simple elegance. A woman could own a little black dress without spending a lot of money. When she wore it she always looked pulled together. It retained its popularity through WWII due to textile rationing. During the 1950’s the popularity of the little black dress took a bit of a hit when it became associated with the more risqué woman, think Marilyn Monroe in a plunging neckline. Audrey Hepburn revived it in the 1960’s when she wore a more sedate version in Breakfast at Tiffany’s. Throughout the next several decades the little black dress went through multiple incarnations. In the 1980’s it featured bits of lace or ruffles at the neckline. In the 1990’s Kate Moss wore a leather jacket to add a bit of edge to her mini skirted, little black dress. By 2000 the little black dress was still considered a staple for every woman’s wardrobe, but by then it was anything you wanted it to be as long as it was black and a dress. The little black dress now includes dresses with lots of glitz. One version is even a baby doll dress that would have been considered lingerie in earlier decades. Today Tim Gunn of Project Runway still says every woman should have a classic little black dress. I, however, think times are changing. The MBA blog says a simple black dress is nice to have, but does not describe it as a must have. The AARP Style Guide for women over 50 lists a black pencil skirt as part of a woman’s basic wardrobe but not a black dress. Instead AARP suggests that jewel tones are much more flattering for the skin of AARP age women. I own a basic black dress. The last time I wore it was in 1991 to my husband’s 50th high school reunion. Do you own a basic black dress? When did you last wear it? I propose that we give up the notion that every woman should have a little black dress; or even a dress at all if you don’t wear them. I, myself, like dresses. But this year I think I will make a new classic dress, but it will be blue or gray or maybe brown, but definitely not black. 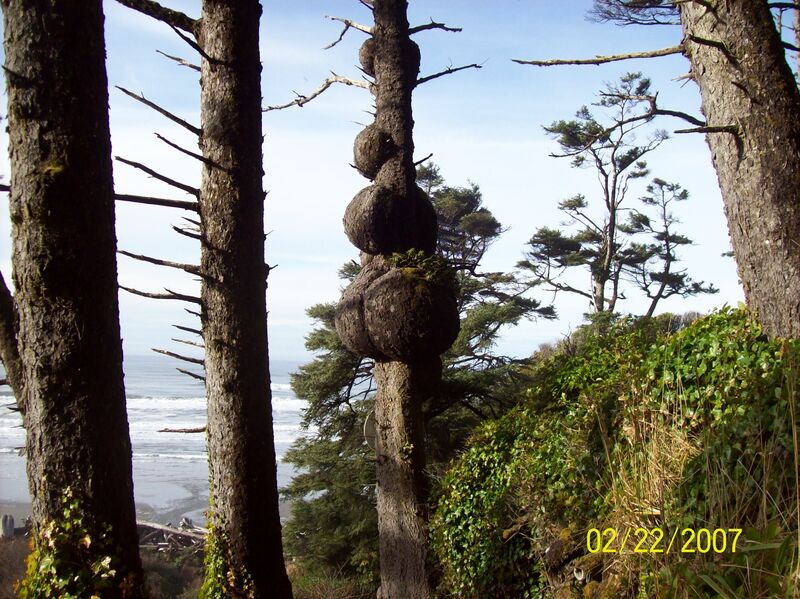 Well these aren’t literally in my back yard, but a quick trip down the coast last fall and a stop at Beach 1 near Kalaloch, Washington revealed this anomaly in the Sitka Spruce growing in and around the Olympic National Forest. The rounded knobs are tumors, possibly caused by a virus that damages the growth cells and makes them grow more rapidly than normal. 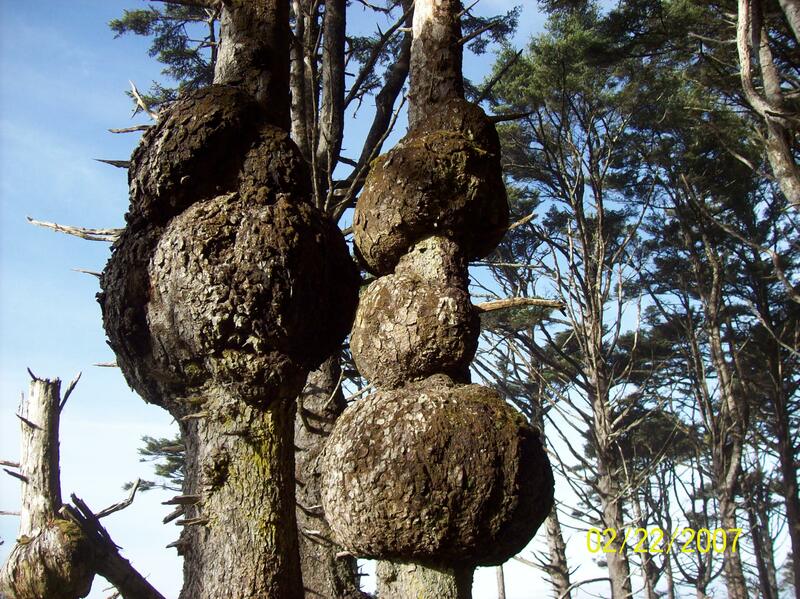 The result—these burls. Cause impassioned longing for the sun. Three word Wednesday: pervert; animate; impassioned. I think a malevolent presence has taken over our lives in the past week. As I probe the events of the last few days I am considering it a temporary presence. I would find it repulsive if it decided to hang around. But I am getting ahead of myself here. I think I better start over. We decided to remodel our master bathroom. Hubby usually just shrugs when I ask him which counter top he prefers or which flooring he thinks is best. However, I discovered that he has definite thoughts about the toilet. It must be taller than standard. It must have a wooden seat and lid, no concave plastic thing. It must be guaranteed not to clog. And it must be eco-friendly. Who knew there were so many decisions to make regarding a toilet? At least it wasn’t the most expensive one in the store. We finally agreed on all the details and took ourselves out to lunch. Immediately after we spent the money, my husband’s front tooth split. The crown is scheduled. Then we discovered a crack in the other toilet. It must be replaced. This morning our television quit working and I broke my favorite glasses. That malevolent presence must go. 3WW Words: malevolent, probe, repulsive. I grew up in Southern California during the 1950’s. It didn’t snow in our neighborhood. The rare sleet or hail storm was almost as exciting for us as the snow is for children here in the Pacific Northwest. I remember at least one time that our Church took us to the mountains to play in the snow. This was supposed to be a rare winter highlight for us. I must have been ten or eleven years old because it was before we moved into the Poppy Way house. Mother packed sack lunches for my younger sister and I containing a peanut butter and jelly sandwich, an apple and two cookies. Then she dug out our winter gear. We had mittens, not gloves. Mom attached our mittens to a length of yarn and strung it through the sleeves of our coats to make sure that we didn’t lose them. I was old enough to find this embarrassing, but now realize how practical that was. We didn’t have fancy jackets or waterproof snow suits like those commonly seen today. Instead we donned our brothers hand-me-down plaid flannel shirts, pulled on a pair of pajama pants under our regular slacks, and put on two pairs of socks. We packed a change of dry clothes into a bag, added our boots, coats and scarves and we were ready to go. We joined our friends at the church and were assigned to a car. Parents drove in those days. Our church didn’t have a bus or van. The trip seemed to take forever. As we made our way up the mountain pass the rain turned into tiny snowflakes that spotted the windshield. We had never seen it actually snowing. Anyone living where they have winter weather wouldn’t have considered what we saw as snow. It melted as soon as it hit the glass. But for us the excitement was almost unbearable. It took forever before the driver in front of us pulled off the road into a little turnout. Not a parking lot, just a little turnout. Our driver followed. Soon we all piled out of the cars and put on our coats and boots. I remember that at that time I didn’t have regular boots, I had overshoes instead. They were just a rubber slipper that slid over my shoes. They didn’t even cover my ankles. They were designed for walking in the rain, not playing in the snow. I considered my coat as really luxurious. It had a faux fur yoke and collar. The body and sleeves were “wine” colored corduroy. It was long enough that it reached my knees. Most of the kids had some kind of knit cap, but my sister and I had scarves to tie around our heads. At first we made snowballs. We didn’t have enough snow experience to think about a snow fight. We tried to make a snowman, but none of us really knew how and none of the adults seemed interested in instructing us. We didn’t have a sled so we just sloshed around in the wet snow. What had resembled snowflakes on the trip up the hill soon turned into a torrential down pour. Our inadequate gear left us defenseless against the moisture. We had been in the snow for less than half an hour when the adults nudged us back into the cars; the girls in one and the boys in the other. We were happy to submit to their commands. We all changed our clothes right there inside the car, first sliding off our wet shoes and pants and replacing them with our dry ones. Next we slid our arms out of our coat sleeves and slipped off our wet shirts while still covered with our jackets. We replaced the wet tops with our dry ones before we removed our coats. Our coats were too wet to put back on, so we sat shivering inside the car while we ate our lunches. Then the adults drove us back down the hill. Perhaps it should come as no surprise that as an adult, I don’t really get too excited about going out in the snow. Written for Three Word Wednesday words: highlight, instruct and submit. Also written for The Short and the Long of It: Three words: plaid, moisture and defenseless.